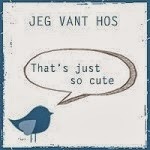 Scrappelises blogg: Christmas in May. Yes, a bit early, but Sketchy Colors # 209, are asking for red, green and white this time in their challenge. And that`s Christmas to me. Challenges 4 Everybody # 41 Anything goes. and at last, Kort o Mania# 107, same theme, Anything goes! The stamped image from Bildmålarna is colored with Promarkers. The diecut which says Merry Christmas in norwegian comes from Rox media and the beatiful patterned paper is designed by a most talented norwegian girl; Vibeke Spigseth. Så flott et julekort. Lekkert motiv og flott pynta. Tusen takk for at du deltar hos Sketchy Colors, lykke til.